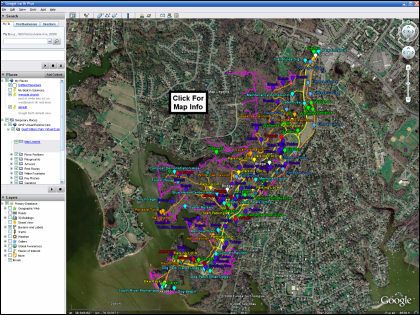 A screen shot of Quiet Waters Park Virtual Explorer, which is based on Google Earth. One of the numerous unpaved trails that wind through Quiet Waters Park. I had been a frequent visitor to Quiet Waters Park for the several years that I lived in Annapolis, Maryland (I now live in Solomons). I think it's a terrific park, since it has so many things to offer. 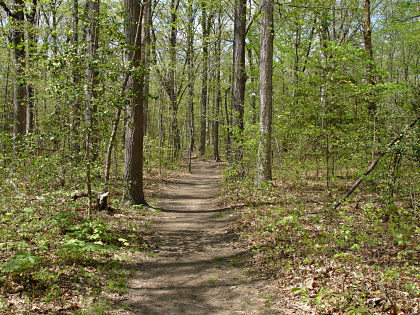 Personally, I enjoyed walking and biking the paved trails, as well as exploring the unpaved trails that run through the woods. I never could find a trail map for the unpaved trails, so I decided to make one. Over the course of numerous visits, I walked all the trails in the park several times each, all while collecting track log information on my GPS. I also took hundreds of photographs of the trails and many other points of interest in the park. It took quite a while to put all this information together, but I recently finished and made the resulting map publicly available via my personal website. I call it the Quiet Waters Park Virtual Explorer, and it uses Google Earth to display an extensive set of map annotations that show the locations of more than 200 points of interest (each with a photograph), plus all the paved and unpaved trails within the park. This information is all contained in a file that is publicly available on the internet (on my website), in a format that is understood by the Google Earth program (a kmz file). Google Earth is a free program that lets you visit anywhere on Earth and examine detailed satellite and aerial photographs. In many areas, you can zoom in to see individual houses, cars, and even people! The imagery for Annapolis and Quiet Waters Park is particularly good. The program runs on your home computer (PC or Mac) which must have a high-speed internet connection. You can download a free copy of Google Earth from the internet.